Actuaries are business professionals who measure and manage the financial implications of future events—pro and con, certain and uncertain, probable and improbable. Actuaries measure and manage risk. With a deep understanding of mathematics, actuaries forecast possibilities and develop plans to manage financial risks. Applying a blend of math, statistics and business knowledge, they serve as trusted financial and business advisors. Actuaries inform and make decisions that lead to profits, savings, stability and success. With actuaries’ help, businesses can grow and provide greater value; leaders can make strategic decisions based on a clear understanding of risks; and people can prepare for the future with greater confidence. Actuaries work in insurance and everywhere in-between. Actuaries are at work all over the world—anticipating and solving financial, economic and other problems for companies, institutions and societies. In addition to the SOA, the Casualty Actuarial Society (CAS) is another major actuarial society, focusing on general insurance including property, casualty and similar risk exposures. Both societies provide professional designations: Associate and Fellow of the Society of Actuaries (ASA and FSA) and the Casualty Actuarial Society (ACSA and FCAS), respectively. These designations serve as recognizable credentials to signify that an individual has been properly trained to practice as an actuary. The career as an actuary has been consistently ranked as one of the best career choices in US by almost all sources. In 2015, according to Business Insider, Actuary was ranked as the #1 job in America in terms of income, outlook, environmental factors, stress, and physical demands, with annual mid-level salary of $94,209. Actuaries are in high demand, with an entry salary of $45,000 – $55,000 annually. Salary increment is based on one’s experience and actuarial exams passed. Students who have passed one or two actuarial exams can easily get summer internships and job offers after graduation. Upon employment, many companies will generally provide support for employees to pass additional actuarial exams, and necessary study time during the workday. To become an actuary, one must pass a series of exams administered by either the SOA or the CAS actuarial societies. The websites www.soa.org, www.csa.org, and www.beanactuary.org contain a wealth of information about the role of an actuary, the actuarial exams, and career opportunities. The Actuarial Mathematics concentration within the Master’s program in the Department of Mathematics and Statistics at UNCG prepares students to acquire the knowledge to pass the initial actuarial exams and to pursue a career as an actuary. In addition to providing students with a solid foundation in applied probability and statistical models, as well as their applications in the area of actuarial science, we have designated courses that cover the topics and materials for the first few actuarial exams. In particular, we offer actuarial exam preparation seminars to help students pass the initial exams. Becoming an actuary is an exciting career choice. However, it is a long journey. While one can pass the initial couple of exams quickly and start working, it is expected to take at least 5 to 10 years to pass all of the actuarial exams. Thus becoming an actuary requires hard work and commitment in addition to strong quantitative and analytical skills. But it is a very rewarding career choice! 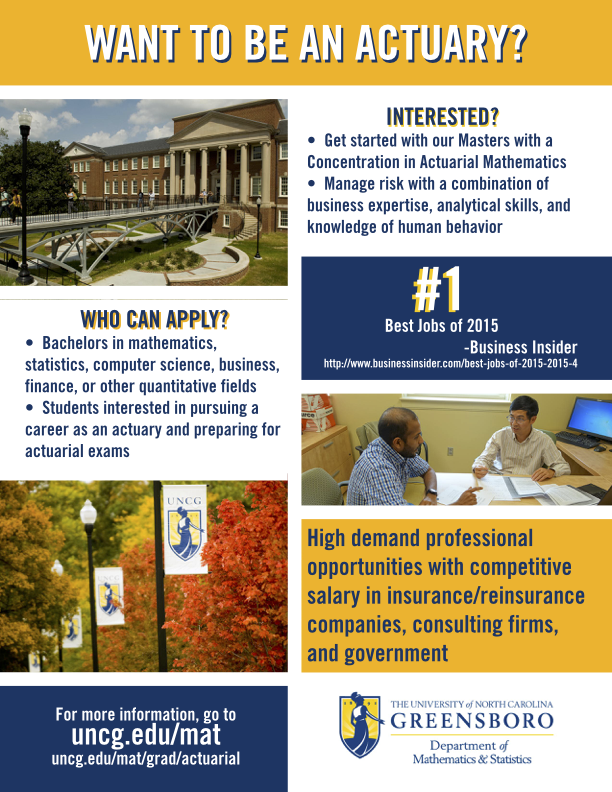 The Actuarial Math concentration at UNCG requires a minimum of 30 hours including an optional 3-credit project. More details can be found in the Graduate Bulletin.